Want to set your Ducati Monster apart from the rest? Available in sixteen (16) color schemes (White with Silver Highlights shown), 1200 R inspired kit is precut (NO TRIMMING required) and will detail your bike in no time. The DuraCOLOR manufacturing process for this item features premium automotive grade vinyl product in the various colors shown. Moreover, the graphics are covered with a 2 mil clear laminate which will protect the graphics from miles of abuse. 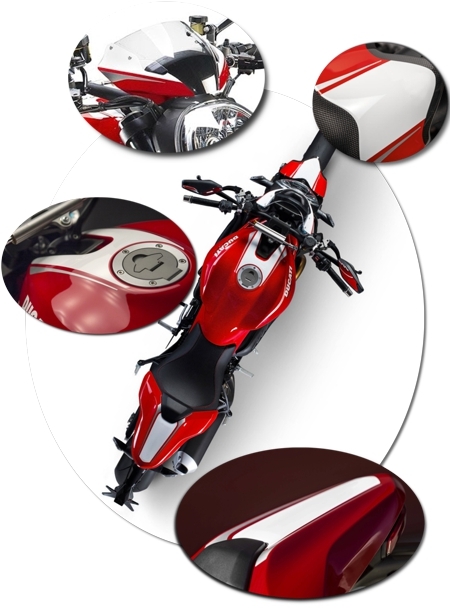 This kit is specifically made for the '14-Current Ducati Monster and will not fit any other bike.